Hope the didn't botch the cover art...man. also includes a digital copy. http://www.blu-ray.com/movies/Sixteen-Candles-Blu-ray/41390/ - yeh cindy i'm sure this was due for a earlier release but has been pushed back as johnny has stated to sept 4th. here is a review of sixteen candles blu ray that comes out in 2 weeks - http://www.blu-ray.com/movies/Sixteen-Candles-Blu-ray/41390/#Review . Suffering from a noticeably filtered look, grain has largely been lifted out of the picture leaving a smoother viewing experience with moments of slight ringing and aliasing." This is the problem with so many blu-ray releases of older movies that drives me crazy. When they do all this excessive dnr smearing to remove all of the grain, they are just removing detail from the image, resulting in a very fake, waxy looking picture that is far different from the film's theatrical appearance. I never liked this movie. Not even the first time back then. Omg i'm rolling that is hilarious!......I almost feel like liking 16Candles is a requirement here.....and quotingfrom it.....you can maybe say you didn't like Valley Girl....or Lost Boys...but SIXTEEN CANDLES!! Is like an unforgiven sin I guess. Well then I'll be crucified upside down spinning my head and vomiting for not liking crappy Sixteen Candles. At least explain yourself. What exactly don't you like about it? I mean there are movies that I don't like that everyone likes, but I give a reason. 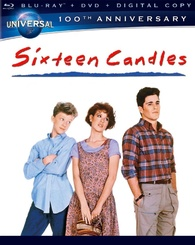 "Crappy Sixteen Candles" makes me think you haven't even seen the whole movie. I'm not going to bash you (yet) everyone deserves an opinion, and I myself have ripped Manhunter, To Live and Die in LA and Pretty In Pink to say a few. I'm just curious to hear your reasons. devo, you rip manhunter and LA, they are great. come on, the will graham speech where he figures everything out, is great in itself. i like the movie sixteen candles, but i wonder why it is so well liked by most. I want to start by saying that movie watching is so subjective and I have been baffled more than once when someone totally doesn't appreciate a movie the way that I do. But I know that so much including our own personalities and taste can influence it, so I try not to overly bash a movie even though I will definitely tell you if it is not a fav of mine. The old theory of one person's junk is another person's treasure definitely applies in the world of movies. With that said .. "Sixteen Candles" is one of my all-time fav movies! My top 20 is always changing it seems, but "Sixteen Candles" has remained in my top 5 for awhile now. Forgotten birthday, The Rave-ups, Confidential note, Jake Ryan, 80's bedroom posters, Long Duk Dong, Graded School dance, Filene!, Water fountain girl, girl's underpants, house party, drive-in food tray, safe as kittens, 80's cordless phone, JAAKKKEE!, geeks in a trunk, Rolls Royce, prom queen photos, Dad explaining crushes, birth control pills, married..sheesh!, headgear, red Porsche, and make a wish! A girl who gets all emo because her family can't remember her 16th birthday. Do I need to say more?.. what is emo? i have seen that mentioned a few times. I would get all emo if my family forgot my birthday NOW....let alone when I was an angsty teen. Not that they could...not that I don't start telling then how many sleeps there are leading up to it. It is a great film though. ah, the funny looking moody people. couldnt they have come up with a better name for their group, like "the positivly challenged"
Back in the day, we just called it New Age. 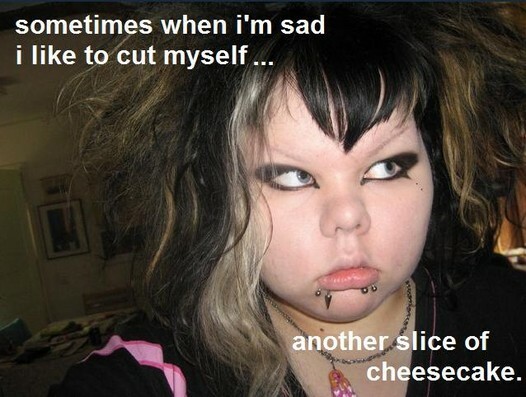 I think these emo-kids are pretty much the same as the new-agers from the 80's. Well i guess that explains why my Blu-Ray 80s movies dont look like its full HD(1080p) The background of the movies all look the same..Grainy. I thought maybe i had a bad HDMI cable? bc my tv and blu ray player are top notch. I spoke to a sellsman at best buys and he say most of the 80s movies on blu ray are NOT remasted in full HD. So i think im going to cease with 80s blu ray movies and stick to DVD format only. The Best Buy guy was wrong - Most of the Studio released 80's movies are in fact full HD. And any movie shot on film is going to have grain in it, no matter what resolution it's displayed in. Now, some will have more than others depending on the quality of the transfer, type of film stock the movie was shot in, source materials used, etc. But I would much rather have a "grainy" looking image than one where all the grain and detail is digitally scrubbed out, which tends to be the norm nowadays.